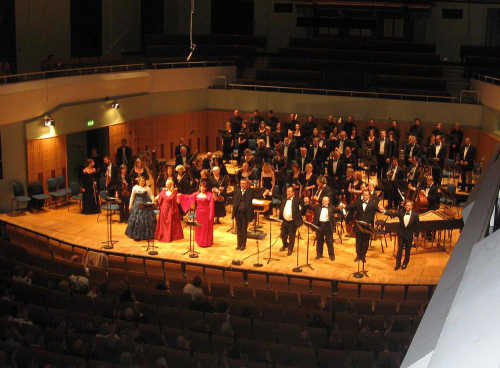 I had begun to think that the 2008 Balfe bicentenary was not going to be honoured in any shape or form, not even in Ireland, until I heard of this performance: Opera Ireland is to be congratulated for their determination and achievement in bringing about this revival. A magical and memorable evening was missed by all bel canto opera-lovers not in Ireland last week. Opera enthusiasts may well have missed the late June posting on Opera or are they not aware that this composer exists, not to mention his 9th opera, Falstaff. But what an occasion! With words by Manfredo Maggione (a friend of Verdi’s wife) and a new performing edition by Dr Langfield (from the full Falstaff score held at the British Library), Thursday’s audience were the first to hear this rarity for 170 years, broadcast by RTÉ two days later. But how sad that Buxton or Wexford Festivals could not revisit Balfe in his important year especially when The Rose of Castile opened the very first Wexford Festival in 1951. BBC’s Radio 3 who were offered a relay facility by RTÉ have ignored this rare event. Certainly the response will have encouraged Opera Ireland and RTE to build on the positive reactions given to Falstaff. What an exciting evening it turned out to be to hear something fresh and melodic for a change, and coupled with such a stunning performance. The auditorium was full with a cross-section of generations and judging by those I spoke to, music lovers of all genres –modern and traditional– all seemed to have come out of curiosity to sample something different! Opera Ireland pulled off an outstanding performance: the soloists were in excellent form and provided us with some exquisite moments. The orchestra under Marco Zembelli’s enthusiastic and exacting direction knew the music well and played with gusto. I must add that the mellow celli added romantic charm to the orchestra’s outstanding musicianship. Zembelli clearly knew his score well and the quality of what we heard was probably due to some keen rehearsing. A fine line-up of soloists approached their roles with confidence and some of these should be singled out. Barry Banks (Fenton), a superbly agile light tenor with good diction sang with excellent clarity and fine tessitura, balancing nicely in his duets. His aria, ‘Ah! La mia mente estatica’ sung from the heart was outstanding, which the audience appreciated. Majella Cullagh (Mrs Ford) was equal to the demands of the part and sang serious determination. Her wide register allowed her to soar with good coloratura in some difficult passages well-managed. Balfe composed a new aria for Jenny Lind in this part, ‘Ah! Simio sposo amato’, which was given its première performance at this performance. Majella sang it with sincerity and fine legato that charmed the audience. I enjoyed the rich bass of Marcel Vanaud (Falstaff) who immersed himself completely in the role and had excellent stage presence in his delivery: I can imagine what a fine performance he would give in a staged performance. (A minor point– I should have preferred Mrs Ford to focus a little more on stage presence than nod with the rhythm when others are singing. Mention must also be made of Tara Erraught (Annetta), who is given some prominence in Act II. I found her cavatina, ‘Non v’è donna’ and duet with Fenton, ‘Rammenta Annetta’, delightful. Some recognition should be given to the well rehearsed chorus (Ireland’s National Chamber Choir) with their strong tenors and velvety altos and their entries were always spot-on. Of the music, the nine minute overture we hear (rewritten for the 1848 revival) is bright and opens with a stirring march of the kind reminiscent of Verdi. This weaves in and out of sections of Act I and forms the basis of its finale. The Italianate style is evident throughout. Unusually, recits. are provided by a harpsichord continuo (its use had generally died out after 1835. ­Bellini only used it once in Adelson e Salvini (1825), and Donizetti up to 1836 (Il Campanello di notte), apart from La Fille du Regiment (1840). The harpsichord was not favoured by Balfe, but perhaps it is used in this opera to revert to an earlier, Shakesperian time. Atmospheric tremolo strings and elegant trombone solo opens Act III (the Forest scene at midnight) with Falstaff found alone wearing his antlers before Mrs Ford enters. Balfe comes across as a skilled composer who can convey to his audience the comedy or tension found on stage. Members of the audience remarked to me, “Oh, that’s pure Donizetti” and “How like Verdi”. The fact is that all three composers came from the same stable: Balfe learnt his craft in Italy like the others and is clearly a match for them, yet the establishment in its belief that ‘the continental bank is greener’ has in its ignorance overlooked the excellence of Michael William Balfe, and William Vincent Wallace for that matter. The momentum now gathered with this performance must not be lost: the audience had no idea what was in store for them yet were thrilled to participate in the first performance since 1838. We have to thank the initiative shown by Basil Walsh (Balfe’s latest biographer who has tirelessly promoted the composer), Opera Ireland and RTÉ for mounting this remarkable event. Hopefully a staged production could be considered for the future. For those who missed the performance and broadcast, RTÉ has been forward-thinking enough to issue the work complete on their Lyric label (November 2008).